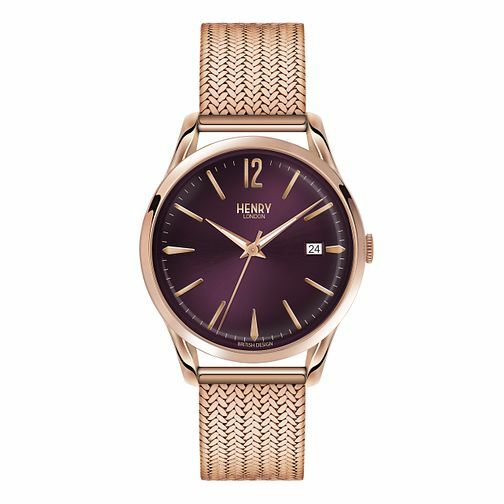 Add a pop of seasonal richness to your wardrobe, with this chic purple dial, rose gold-plated mesh bracelet watch by Henry London, complete with date window at 3 o'clock. Designed to deliver precision and reliability, without compromising on style, the Henry London collection is a tribute to classic era luxury watches. Henry London Ladies' Hampstead Rose Gold-Plated Watch is rated 4.0 out of 5 by 1. Rated 4 out of 5 by Anonymous from good for its price really like it. Bought it for mu mum. Cheap and looks really good. She really liked it.